» The Compleat CARL BUCHANAN [JAMES ROBERT PEERY]. The Compleat CARL BUCHANAN [JAMES ROBERT PEERY]. Carl Buchanan has come up before on this blog, in particular in this post made last January. 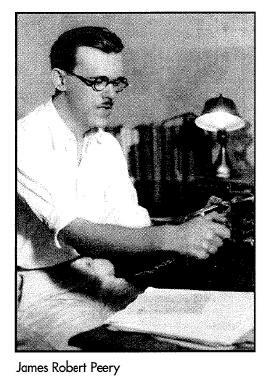 At the time it had just been discovered that “Carl Buchanan” was the pen name of James Robert Peery, a fact which produced a flurry of activity, including a list of the stories he’d done for the detective pulp magazines. BUCHANAN, CARL. Pseudonym of James Robert Peery, 1900-1954, q.v. Born in Mississippi; served in U.S. Army�s Signal and Intelligence Divisions in WWI; worked in banking and cotton before settling into journalism; published two mainstream novels under his real name. Under this pen name, the author of a number of short stories for the US detective pulp magazines and three crime novels published in the UK, included in the (Revised) Crime Fiction IV. See below. 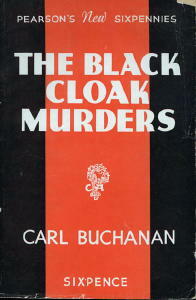 The Black Cloak Murders. Pearson, UK, hc, 1936. Setting: North Carolina. Night of Horror. Mellifont, UK, pb, 1939. The Red Scorpion. Mellifont, UK, pb, 1939. “My sister-in-law sent me your web site, and I just wanted you to know that I am the daughter of James (Jim) Peery. He was a brilliant man who died at age 54. His two novels are Stark Summer, 1939, and God Rides A Gale, 1940. These were the war years and it was difficult making a living as a writer, so he moved to Jackson from Eupora, working as news editor of radio station WJDX and was Mississippi correspondent for United Press. “He died of a thrombosis way too soon, at age 54. I was a junior in college. I cherish my memories: I never had to look up a word in the dictionary as he knew them all. I have no copies of the pulp magazine stories; I was just a child but remember him at the typewriter in the parlor of the family home in Eupora. It was built in 1908 and is still standing despite damage from Katrina. The family who owns it now has renovated it and I go back at least 3 times a year to see it and remember my wonderful heritage. “Daddy was married to his childhood sweetheart, Sudie Leigh, and my mother. Mother was a school teacher and superintendent of education for Webster County. For a time, she supported the family so that Daddy could write his two novels. In addition, James Robert Peery had a letter published in the July 1939 issue of Clues, which neither Victor nor I have seen. If anyone has a copy of the magazine, we’d love to know what he had to say. James Robert Peery was my uncle. I was nine years old when he died and I don’t remember ever meeting him, but when I was growing up my mother told me stories about him and he was a tremendous inspiration to me. Mother did tell me that he wrote stories under a pen name but not what his pen name was.